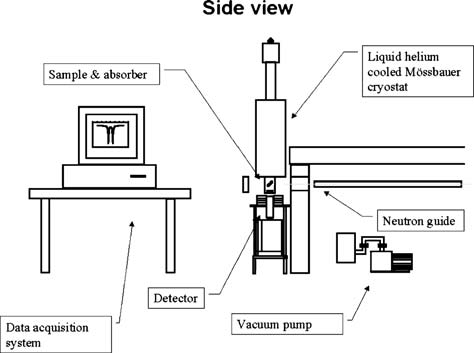 M�ssbauer spectroscopy is based on the detection of the recoilless resonance-absorption of gamma rays originated from appropriate nuclear transitions. In depth information on the features of the method is available e.g. on the wikipedia. The local feature at the Institute of Isotopes is the ability to perform in-situ measurements in our laboratory. I.e., samples can be treated and subsequently measured under different conditions, without exposing them to air. Thus, the actual oxidation and coordination states of the samples can be preserved and studied. This feature is particularly advantageous when studying (heterogeneous) catalysts. Measurements and treatments can be performed in the 77 - 700 K temperature range in variuos ambient atmospheres , e.g. under vacuum (10-2 Pa) or in various reactant gases and in mixtures of them (most frequently hydrogen, nitrogen, carbon monixide, etc.). As a further extension, these gas streams can be saturated with vapours of volatile fluids, as well. The M�ssbauer laboratory is hosted by the Department of Radionuclide Applications. A second, so-called in-beam M�ssbauer device is under realization in a collaboration between the Department of Radionuclide Applications and the Department of Nuclear Research. This innovative instument is being installed at the Neutron guide hall of the Budapest Research Reactor, and will be part of the EU MNI3 program, which makes it easily accessible for EU users. The in-beam technique greatly extends the number of useful M�ssbauer nuclides (40K, 56Fe, 66Zn, Gd, Er, Dy, Yb, Hf, W), thus brodens the scope of structure analysis. 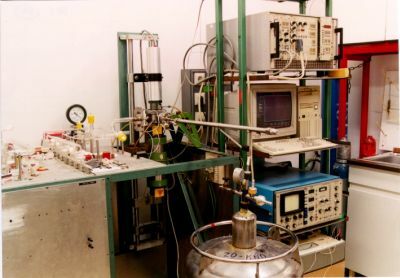 The instrument can be used on line, but during reactor shutdown, activated short-lived M�ssbauer sources (141Pr, 127I, 129I, 181Ta, 182W) will also be utilized. During the on-line operation a beam of guided cold neutrons produce the M�ssbauer transitions continuously. The cold neutron flux, transmitted by a focused supermirror guide is measured to be about 109 n cm-2 s-1, producing a maximum source strength of approx. 1 GBq. The measurement temperature can be in the range of 3-360 K, achieved with liquid helium or nitrogen cooling. External users should contact the operators to access the equipments in advance. Access is provided primarily for scientific cooperations, however measurements on paid base are also possible. The typical use consist of four subsequents steps: i/ preliminary consultation, ii/ measurements, iii/ evaluation and iv/ interpretation of data. The access is free for the members of the thematic M�ssbauer network, however the emerging direct costs (radioactive source, cryogenics, enriched isotopes, etc.) should be shared among the users. The work carried out in the Laboratory should be in compliance with the regulations of handling radioactive materials.